Don’t miss this opportunity to learn about strategic issues that organizations all over the world are facing and compete for cash prizes! Participate in this year’s PricewaterhouseCoopers that will kick-off on Thursday, September 29, 2016, at 6 PM (PIZZA PROVIDED) with team presentations the evening of October 13, 2016. Sign up here: https://docs.google.com/a/bucknell.edu/forms/d/e/1FAIpQLSeslk5w5qS5hklk4W00q-dU9jickT_mhfJWuHdH5J72vKv2OA/viewform BEFORE Tuesday, September 27. Students can sign up with a team or be put in a team. If you have a four member team, know that the School of Management may add another student to your team. 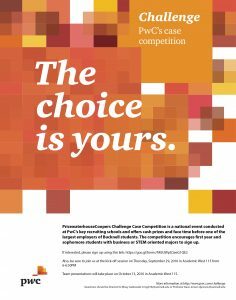 This is a national event conducted at PwC’s key recruiting schools and offers cash prizes and face time before one of the largest employers of Bucknell students. Students who desire to participate should complete the above Google Form and be prepared to attend the Kickoff session on Thursday, September 29, 2016 in Academic West 115 from 6-6:50pm with team presentations the evening of October 13, 2016 in Academic West 115.